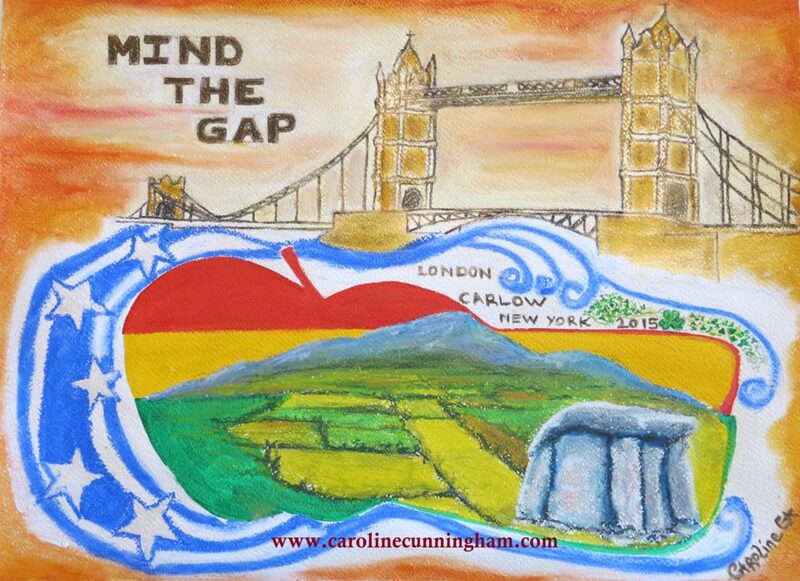 ‘Mind The Gap’ painting and its accompanying poem, were commissioned in March 2015, a few days prior to the celebration of Irelands Patron Saint. St. Patrick’s Day is celebrated by the Irish and their descendants world-wide. The Carlow Association of New York invited its London counterpart to join them in the celebrations that year, along with a number of people from Carlow. It was John Nolan of Carlow London Association who made the call to commission this piece which subsequently was christened ‘Mind The Gap’. I am told the phrase was well used during the weekend of St. Patricks Day celebrations, replacing all greetings and salutations with a resounding ‘Mind The Gap!’ We are still using the hashtag #MindTheGap. It was a very exciting project to be involved with as an artist. Within a few days the painting and poem were dreamed, assembled and presented in New York by the end of the week. These are magic moments. I especially love projects that strengthen bonds between people and places, bringing us all more closely together in friendship and unity. And are nourished by one Earth. Flowing from the Hudson, Barrow and Slaney. Our passion and love for Carlow. Through the Dolmens they created. I present a piece of Carlow.